In 2008 and 2009 fans in the Command & Conquer community finally got hear Frank Klepacki offer his talents and contributions to a new Command & Conquer game for the first time in many years with the release of Red Alert 3, followed by Red Alert 3 Uprising. 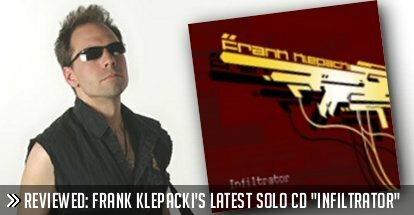 In case you haven’t had enough Frank Klepacki, he returns with his latest solo album called “Infiltrator”. It’s a follow up to his previous solo albums, “Morphscape”, “Rocktronic”, “Virtual Control”, and “Awakening of Aggression”. Fans of Command & Conquer know Frank Klepacki’s style, plenty of fast beats, techno mixes and of course the signature heavy rock. Me personally, I love a good hard and heavy rock song and Frank knows how to deliver this in C&C games. And the good news, he delivers this and a whole lot more on this CD. So that brings us to “Infiltrator”. For this new album Frank has turned back the clock in a sense to the days of Red Alert. Many of the tracks would fit right into any C&C game really, but as you listen to each track you can’t help but be reminded of the soundtrack for Red Alert. Beginning with the first track, Militant Funk, There is no holding back as this one starts off with funky beat and soon rips into some fantastic heavy guitar riffs. These riffs carry the song but you can still hear up beat techno in the background. All of this blends together well. 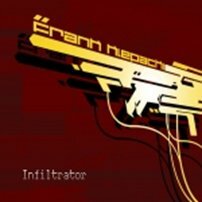 Moving onto the title track from the album, Infiltrator, this is one of my favourites. Not as heavy as the opening track, this one slows the pace down somewhat with more funky beats and nice mellow electronic solo to mix things up a bit. Track three, Ownage, is where things really get heavy. Right of the top your greeted with mean riff and gutsy sounding drums. Things never let up in this one; it keeps building and building all the way through. The final push is a real treat, at least for me it is. I just love the way final few minutes are put together. Up next is The Edge. Again we move back to a more techno beat here. We get some softer interludes for this one. The good thing about this track is your not hearing the same beat recycled over and over. Frank does enough to keep it interesting, especially in this one. Extra points for a nice fade out, no one fades any more. Halfway through, and Construct is the next track. For some reason this track reminds me of something from the Transformers movie, not the more recent live action movie. I’m talking about the classic 1986 animated movie, which has one the most memorable soundtracks ever. Anyway Construct is a track of two halves, plus a little bit more. The first half moves along with its techno style and then all of sudden you are rewarded with a sweet riff. To finish things off it reverts back its techno beginnings. Number six is Chillin, and as the name would suggest it does exactly that. What we have here is a kind of atmospheric track to set the mood, after all the fast and heavy stuff that preceded it. At the start there is what can only be described as an “interesting” sound that eventually builds into nice bass beat. This beat carries on for the entire track; it changes up mid way through and mellows out again towards the end. Really Cool! Bulldozer is the seventh track, and with name like that you are probably thinking its back to rocking out. And guess what it doesn’t disappoint. Right of the top you get a big fat techno beat quickly followed by some great heavy riffs to set up the main beat. The beat is pure head banging stuff. But you can’t head bang for too long though. There are some pauses to catch your breath. The eighth track is called Odd Funk. And yes it’s another one that gives you an idea of how it sounds simply by reading the title. This is one of my least favourites unfortunately. Bad that’s not knocking the track overall, because it is a clever mix of beats. Second to last in the list is Get On It. This one has a fast paced choir sounding intro that I really liked. To avoid the “just another techno track” problem, it features a great electronic voice saying “Get On It” at various stages. There some industrial sounding interludes that bridge each part of this one together perfectly. And last, by no means least is The Reaping. I have to say this one is my overall favourite, simply because I’m total sucker for heavy metal. What we have here is nothing but fast and fat sounding guitars, loud drums that all mesh together to form the heaviest track on this CD. And damn it, I love it!